← Turning Japanese 2013: Let’s Go Tokyo! Korean artist Jee Young Lee doesn’t need water colors or acrylics or canvases and easels to create art; she simply builds it in her studio. Lee, of Seoul, South Korea transforms her small 12 x 13.5 x 8 feet (360 x 410 x 240 cm) studio into complex, self-contained worlds in which she expresses some aspect of her own journey of self-discovery based on personal experience and old Korean fables. Perhaps the most amazing aspect of the work presented here, which are part of her recent series Stage of Mind, is that each piece was painstakingly created without any photo manipulation at all. She builds every set detail by hand, a process that can take weeks or even months, and then lights and photographs the scene, inserting herself in each piece as a solitary figure within her own creations. It’s amazing what one can do with a little creativity, imagination and a lot of elbow grease. Ladies and gentlemen, presenting the digitally unaltered and surreal worlds of Jee Young Lee. This entry was posted in Art, Weekly Art and tagged Art, Artist, Jee Young Lee. Bookmark the permalink. Hi, Stephen. I really, really like Jee Young Lee. How old is she, what’s her artistic background and history, can you tell us anything particularly about her life? This is one of my favorite of your features. 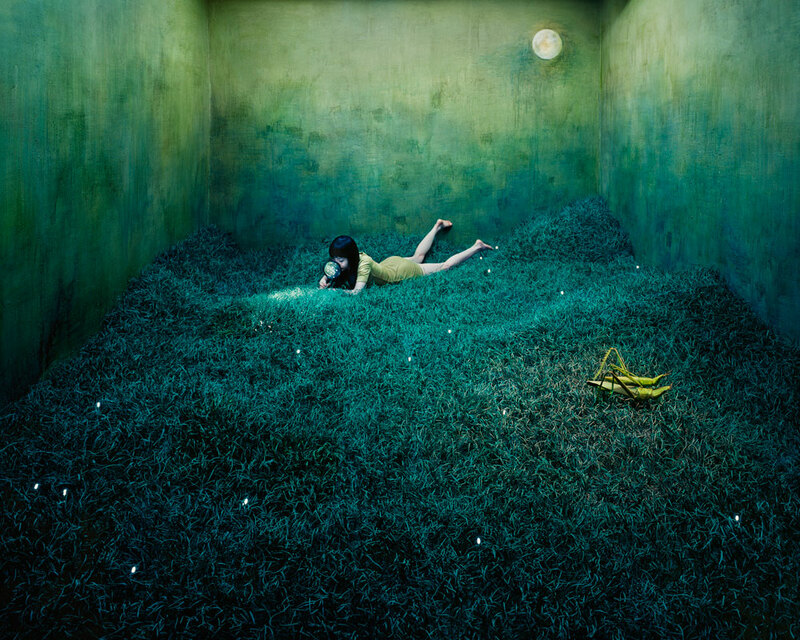 I just recently discovered Jee Young Lee and I LOVE her work! So imaginative, so much quiet emotion! I had a difficult time finding personal info on her; she’s apparently a pretty private person. I learned she just recently graduated from art school in Korea, and that she’s in her mid-20’s, but that’s about it. I usually try to find interviews where I can glean more info, but this time I found even those to be lacking. I guess we’ll just have to let her art do the talking! Hi Pat … me too! Really clever work. Like you said, tho, some of it is very dark. If her work is based on personal experience, she must have a lot of complex stuff going on! Hi there … yes, I’ve been seeing a little more of her on various art blogs, so I guess people are taking notice of her amazing work! Amazing creative, beautiful, artistic work! Thanks for sharing. These are amazing and true works of art! This artist (photographer) is extremely inspiring in so many ways! I love that she does not manipulate her photos – which makes them real! Just fantastic…thank you for sharing! hi there photoeye … well said! I love how painstaking she is in creating these strange worlds. look you said, very inspiring. Wait, whaaaaaat! This lady’s work is unbelievable. Are those painted paper plates? everything is just so colorful and bizarre, just the way i like it! hey there impybat … once again, i knew you would just love her work!!! These are otherworldly – and incredible! hey there, hookie … yep, weird, wild stuff! How unbelievably creative!! Have never seen or heard of anything like this before! Thanks Stephen. I love these surrealistic, dream-like images. Fantastic work by the artist.